Well, just to keep up with what's been going on. 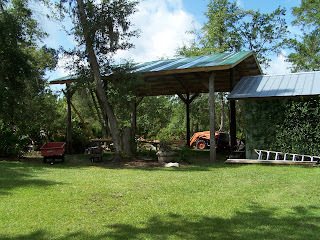 Brian has made great progress with his pole barn. Much thanks to Jacob and Danny for lending a hand. It looks really good and I am hoping this gives him ample space to work on his projects like he is wanting and maybe a few side jobs. Brian is an awesome handy man and I feel so proud of him for all that he's done, esp. under the circumstances. Some days he didn't have any help, but that didn't discourage him- he manages anyway he can, even if that means being creative or going the extra mile. David has even caught on- he said to me the other day "it's okay mommy, daddy can fix it", this is when the mower died on me. how cute is that? I am so thankful to have a man that can fix just about anything. 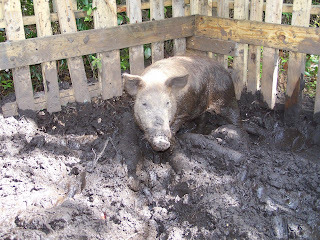 And, as if building a pole barn is not rustic enough- we caught a hog! Yes, a pig, hog, "bacon" whatever you like to call it. It seems there are herds of them coming into our yards, neighbors too and digging for acorns, bugs, what have you but they love corn. So, my darling husband built a pen and managed to catch one. He's been a prisoner for about a two weeks now, getting fed and watered like a pet. His buddies come and see him at night- I imagine they are jealous. The kids enjoy him and to hear Daniel say "hog" and snort, is enough to keep him around. I go out to help take care of him occasionally, but I really like to pretend that he's not there- until he is in plastic wrap and I don't have any idea how he got there. This has taken a little getting used to, I don't take it as lightly as it may sound. I guess I just don't have a huge say in the matter, (and it does make sense) so I find the easiest way to handle it. Anyway, the kids spend there days outside anyway they can. 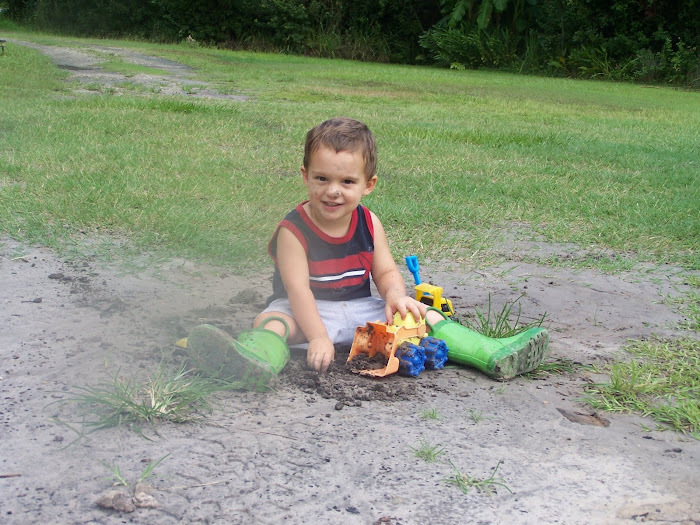 Here's proof that a little mud can bring a lot of fun or just cute kids for a picture. No way you have a hog??!! We must have a playdate at your house again soon, I have to see this first hand. So are you going to name it or not getting that attached? 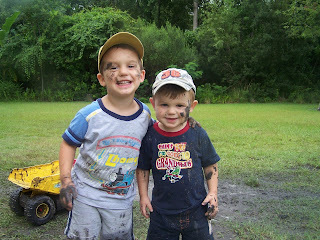 Love the pic of the boys with mud, too cute!! !